Lights has announced details of her next project, Skin&Earth – an album and comic book series. The digital intro issue will be released in May, with the first print issue – Skin&Earth #1 – on sale July 12 via Dynamite Entertainment. 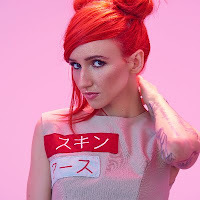 The monthly comic book series (written and illustrated by Lights) will kick off just before Comic-Con International, with new music accompanying each issue and leading into the Fall 2017 release of Skin&Earth, Lights’ next full-length studio album on Warner Bros. Records.